Airedale Terrier has a broad range of skills – they can hunt birds, retrieve downed birds, and track and tree mammals, both large and small. Airedale Terriers were also the first breed used as police dogs in both Great Britain and Germany, and in wartime, served as guards and messengers. They were prized by both law enforcement and military because they retained their training well and would work through harsh conditions and discomfort. The Airedale Terrier breed was developed in Aire, England, probably from the English Terrier. Some experts feel the Otterhound was crossed with the English Terrier to help create a waterproof coat and to add to the first breed’s hunting abilities. After the mid-1800s, the breed was known as the Working Terrier, Waterside Terrier, and Bingley Terrier. Male Airedales stand about 23 inches tall at the shoulder, with females slightly shorter. Both males and females are well-muscled and sturdy, with an athletic appearance. The black and tan coat is wiry with a slight wavy texture. Airedales stand tall, on straight front legs, with their heads held high. The ears are V-shaped, folded at the side of the head, and alert. The eyes are dark and expressive, with an alert, intelligent expression. The tail is carried high. The Airedale’s coat requires daily brushing and combing to keep it clean and free of debris. The coat grows continually, and a visit to a professional groomer every six to eight weeks is necessary to keep the coat looking as it should. Airedales competing in conformation dog shows are hand-stripped (rather than having the hair cut with clippers). If you wish to show your dog, ask your dog’s breeder to show you how to do this type of grooming. 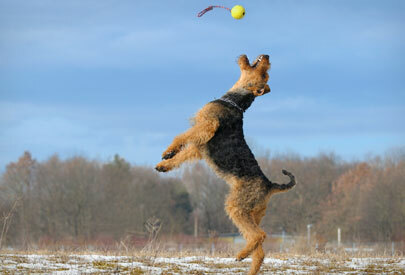 Athletic, active dogs, Airedales need vigorous daily exercise. A casual walk morning and evening is nowhere near enough for a young, healthy Airedale. Instead, these dogs need a brisk jog or run alongside a bicycle, a twenty-minute game of tennis ball fetch, or a workout on the agility course (or all of the above) every day. Airedale Terriers are intelligent dogs and retain what they have learned quite well. Airedale Terrier puppies should attend puppy kindergarten classes to begin their training. The socialization in these classes is also important. Airedales can be hardheaded when they get bored, and very stubborn if the training is not fair. You must figure out what motivates your dog, and keep one step ahead during the training process. Keep the training fair and structured and lots of fun, and the Airedale Terrier will always be looking for more to do. The Airedale today is a strong, active, and very physical dog. The breed retains its hunting instincts, so a gopher or squirrel in the yard could cause great excitement. They have excelled in many sports, including obedience, agility, tracking, search and rescue, and carting. Many are still used for hunting. As hunters, Airedales should not be trusted with small pets, and interactions with the family cat should be supervised. Although Airedales can be great family dogs, they are rambunctious and must learn to behave around small children. The primary health concerns include hip dysplasia and hypothyroidism. Share your Airedale Terrier story. Note: Upload only Airedale Terrier picture or your picture with Airedale Terrier below - spammer's ip may be blocked. A rowdy handful as a puppy, the Airedale Terrier matures into a dignified, self-assured, courageous adult. This athletic dog romps and plays hard. Without vigorous exercise and lots of personal interaction, he is easily bored and may become destructive as he seeks to entertain himself. Young Airedale Terriers are especially rambunctious and can turn your garden into a moonscape of excavated moles and tulip bulbs. Mental stimulation (hunting, obedience, agility, playing games) is essential for this thinking breed. You can’t just leave him alone all day or stick him outside and hope that he’ll lie down quietly and be happy. An Airedale’s attitude toward strangers varies from enthusiastically friendly to sensibly polite, but even the friendly ones tend to be vigilant watchdogs. Some individuals are more protective than others. With other dogs, most Airedale Terriers are bold and aggressive, and with their strong hunting instincts they must be exposed early to cats, else they may not be safe with cats. Rabbits and rodents are not a wise addition to the household. This breed is very smart, but also independent. Unless you establish yourself as the alpha (number one), he can be headstrong. Yet assertive owners who know how to lead will find him eminently trainable. I didn’t know I was looking for an Airedale Terrier. I was in my twenties when I got my first “Dale”. I have had 3 others in the last 20 some years. I had been looking for a dog.I didn’t know what kind of dog but I had owned a terrier as a kid. I was self employed and didn’t want to raise a dog, expecially a larger dog such as an Airedale Terrier in an apartment. So I bought a mobile home and began to save for a down payment. so I am in my truck much of the time going between jobs. To fill the time I listen to talk radio. Living in Colorado I listen a lot to KOA, a major talk station. At the time of this story there was a host, Alan Berg, who eventually gained national notoriety by being assasinated by a white supremecy organization. That’s a completely different story though. Alan had a dog that he would talk to over the air-waves during his show. Every once in a while he would call out “Get the ball Fred… Get the ball.” While some may have found this annoying, I found it compelling. 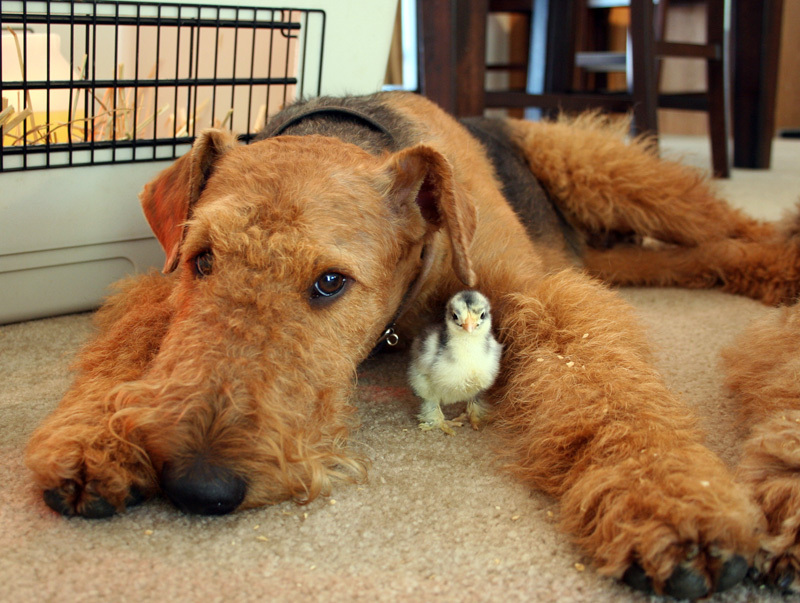 I had heard little of the Airedale Terrier, but Alan would describe Fred and his antics often. I started to investigate and liked what I found. By the way, Fred found a good home when he lost his master. When I finally was able to afford a down payment on a house the first thing I did on the property was to build a six foot fence around the back yard and a four foot one around the front. I looked through the Denver paper and found an Airedale mix that looked good. I couldn’t get to Denver because it was in the middle of my busy season so I asked my brother who lives in Denver to go over to the breeder and pick me out a good pup. I went through work that day hoping I could trust my brother to know how to pick a good candidate. He called me that evening saying he had picked out a feisty little boy. I got down to the city that evening to pick up my “boy” who was only six weeks old. When I got back home I spent some time with “Buster” getting him used to me and trying to introduce him to Max the cat. While playing with him on the living room carpet I rolled him over on his back and disovered that he was a she. I’ve never let my brother live that one down either. It’s a great story to tell around the Thanksgiving table. So I had to change “her” name as I didn’t think I wanted to stick with the name Buster. I was listening to the radio and “The Beatles” Hey, Jude was playing. She became Judy and was the light of my life. I finally had an Airedale. Even the veterinarian I took her to for her initial checkup could not determine what other breed was in her mix but it must have been a terrier and except for the straighter hair she looked and acted all Airedale. Judy taught me the Joy of Airedales… Unlike most puppies she was never un-graceful. Oh she left her share of pee on the rug and a few surprises in the corner, but she always knew what to do with her body. Stairs were nothing to her. She took to the leash like it was second nature. She was never that gangly scatter-brained pup that you think of. This was her greatest quality which would be her greatest asset throughout her life. That was Judy. I’ll get into why this quality was so important to her in her later life in another story. The Airedale Terrier is known as the “king of terriers” partly for his size. They range in height about 23 inches and in weight from 45 pounds for a small female, to 70 pounds for a large male (20 to 32 kilograms). Airedale terriers can vary greatly from being quite finicky eaters to being prone to obesity. This breed is active and needs plenty of daily, regular exercise. Combining training with exercise is often a good move as Airedales thrive on mental and physical stimulation. Airedales tend to live about 12 . 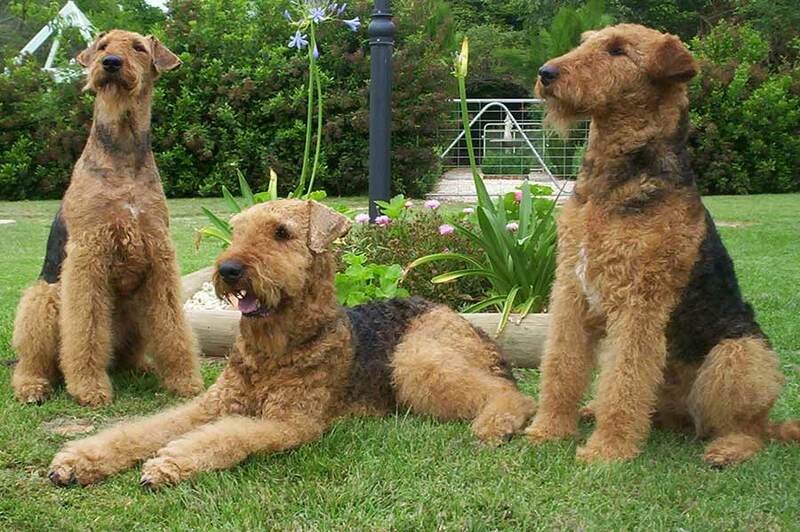 The Airedale terrier traces its ancestry back with many of the other terriers to the extinct black and tan terrier. These feisty dogs were bred to hunt vermin of any size or shape. They were somewhat lacking in scenting skills and swimming ability though, so in the 1800s near the area of the River Aire these terriers were crossed with otter hounds to create the “king of terriers”: the Airedale terrier.